Tip # 9: Make time for gratitude. Energy flows where attention goes. 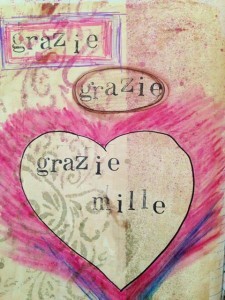 Take 2 minutes a day to write down 5 things you are grateful for. It seems taking time to be grateful is good for your health. In the video below Oprah talks about what she knows about gratitude. Image above from the awesome Bean Up The Nose Art collection. A working toilet! That is so worthy of gratitude; wish I’d thought of it. I was just posting on another person’s blog today that my lists may be written in a tongue-in-cheek style, but my gratitude is always sincere. I’m pretty much in awe of all that I have most of the time.